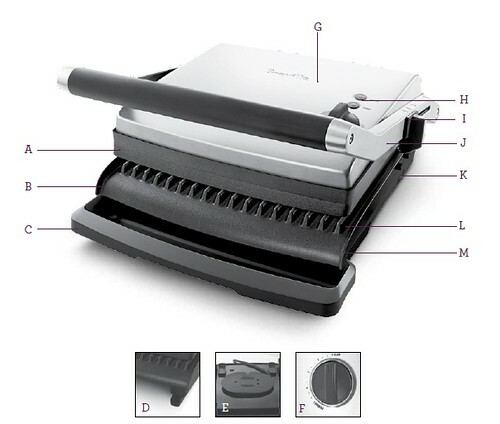 The BGR200XL Panini Grill™ – The ribbed, non-stick cooking plates offer a 115-square-inch cooking surface to accommodate steaks and Artisan breads. And the extendable feet can be flipped forward to level the bottom cooking plate, or flipped backwards to angle the bottom plate and drain the maximum amount of fat while cooking. A. Floating Hinged Top Plate - The top plate automatically adjusts to thick or thin meats, seafood, vegetables or sandwiches. B. Non-Stick Cooking Plates. C. Removable Drip Tray. D. Angle Adjust Non-Slip Feet. E. Convenient Cord Storage in Base. F. Variable Temperature Control Dial. G. Stainless Steel Housing. H. POWER and READY Lights. I. Adjustable Grilling Height Control Clip with 7 Settings. J. Die-Cast Arms. K. ON/OFF Switch. 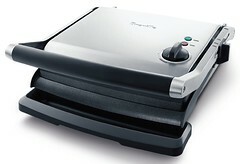 L. Angled Ribbed Grill Plates. M. 1500W Element.